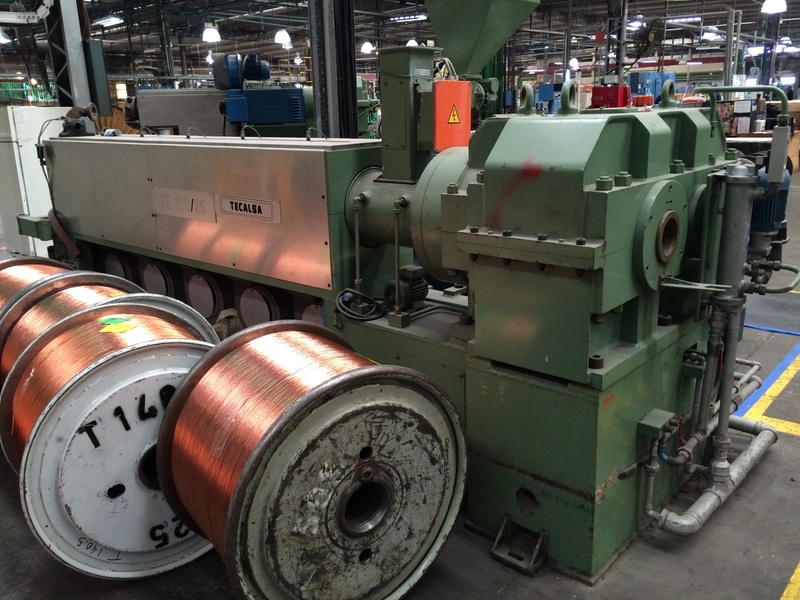 The following step in the production of conductors consists in applying an insulation layer around a flexible conductor made of various fine bare wires or around a sole rigid bare wire. This process is carried out on an extrusion line (insulating line) which includes an extruder fed continuously with granules of PE, PVC or any other insulating material. 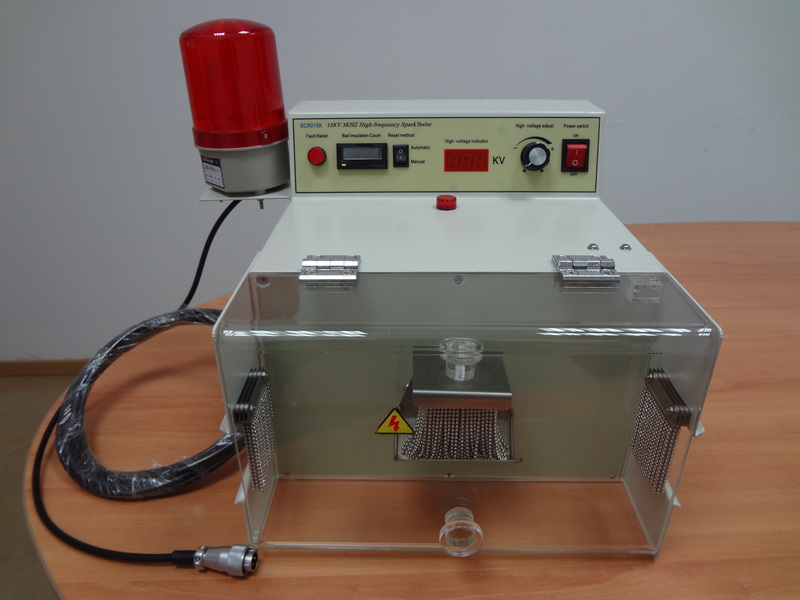 The machine will be mixing and heating the granules until they reach the correct temperature and viscosity. The wire will go through the cross head on the extruder in order to get the insulation layer of the desired colour. After this it will go through a trough filled with running water which will be cooling the applied material and thus solidifying it very quickly. The conductor will be going through various testing equipment in order to detect possible faults (spark tester, diameter controller, etc.) This process is generally realized at high speed. 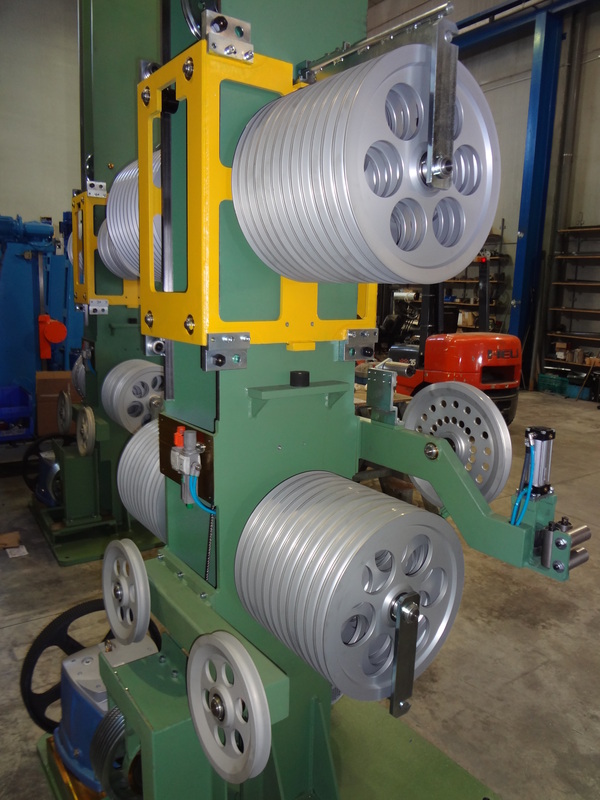 Sometimes before the armouring process (with steel, copper or aluminum wires) is carried out, some cables made of assembled conductors might need an inner sheathing which will be applied on an extrusion line of larger capacity in order to give the cable a smooth finish. In the case the cable does not need this inner sheathing (e.g. because it is not armoured) the outer final sheathing will be applied directly. We manufacture and we supply cross heads for PVC, PE, XLPE, PTR, etc. with heating by electric resistances. We also manufacture cross heads for rubber and silicone with temperature regulation by liquid. 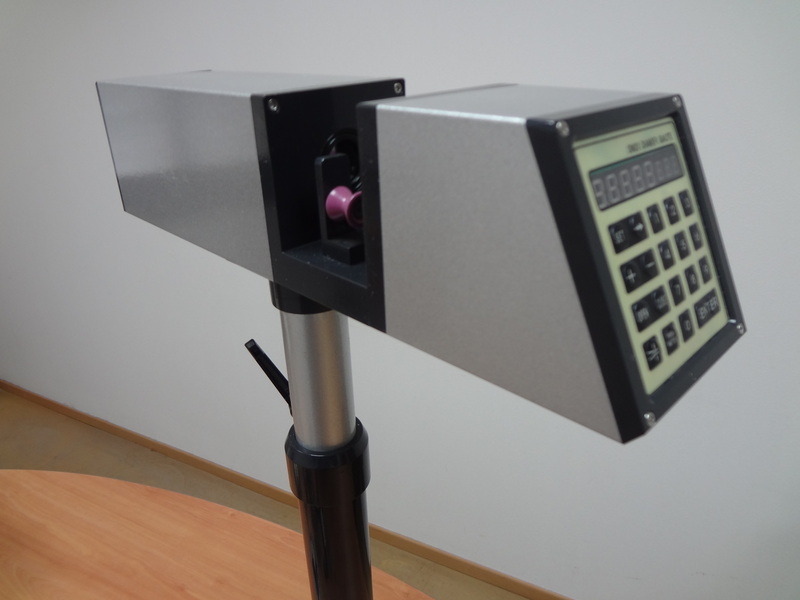 Dimensions ranging from 14/20 up to 180/200, with die-holder mechanical positioning regulation. Possibility of monolayer, bilayer and triple layer. Skin option, fringes, etc. 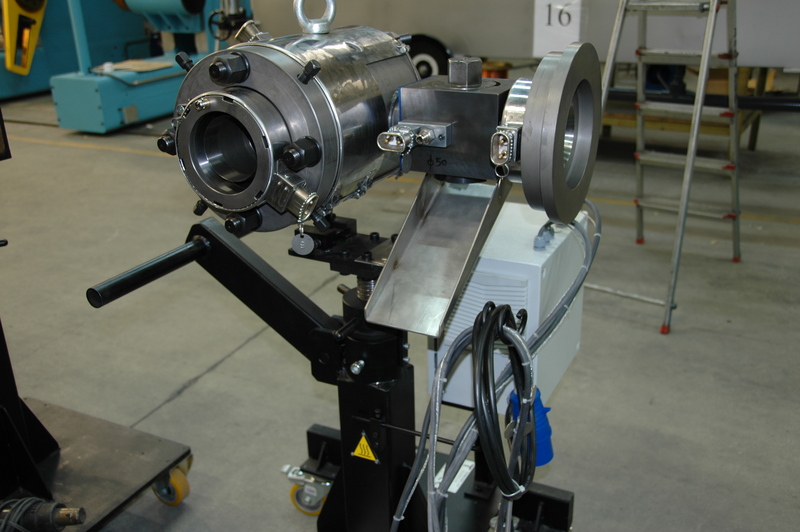 Manual system for die centering. Optionally: “0” positioning system. We also manufacture links, purge systems, support trolleys, collars, etc. Possibility to adapt the cross head to the tools of the customer. 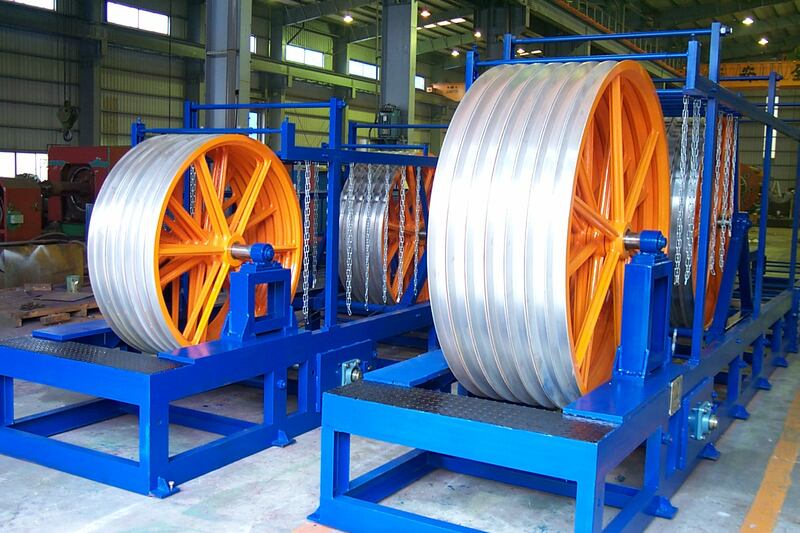 We manufacture upon customer’s request the whole range of motorized pulling capstans, simple or double wheel, grooved or not or with flat belt. 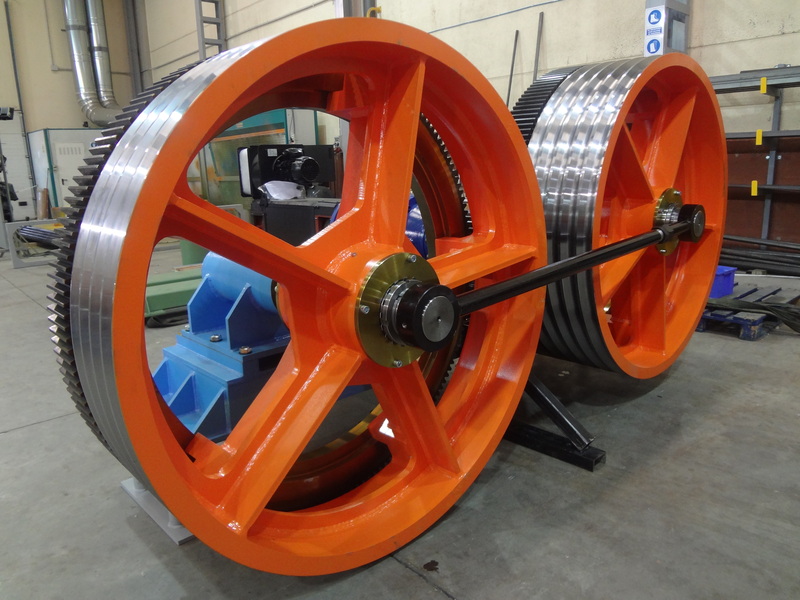 Wheel diameters can vary from 600 up to 2000 mm for cable diameters up to 35 mm and maximum speeds between 30 and 600 m/min. 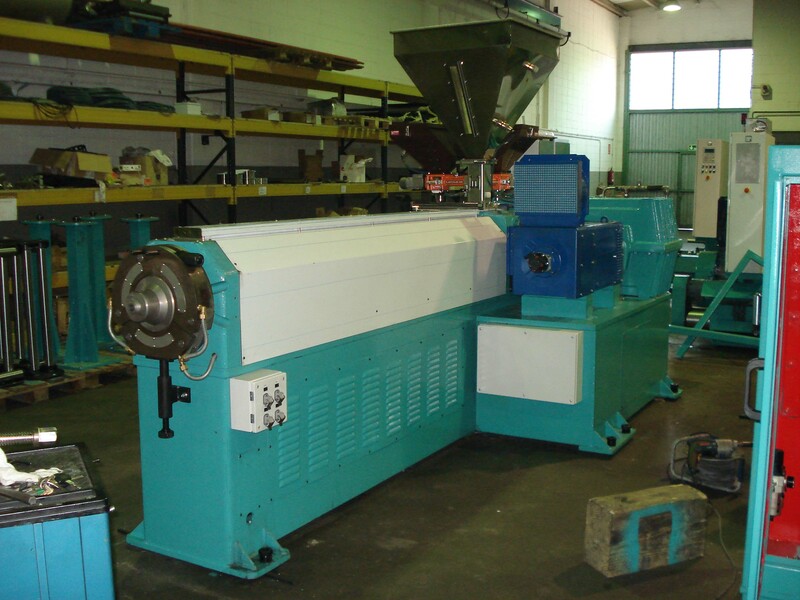 depending on the type of extrusion line. Our caterpullers with independent motor, can be giving or pulling caterpillars. 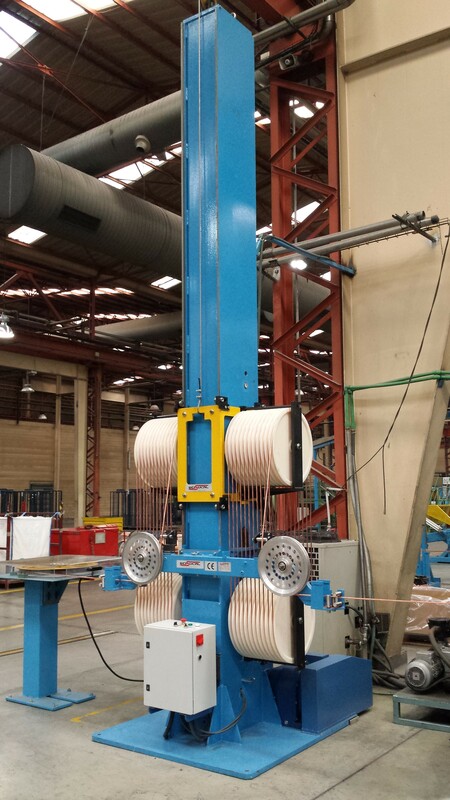 They are composed of 2 pulling flat belts which are pressing on the cable through 2 rows of pneumatic cylinders equipped with cylindrical rollers. 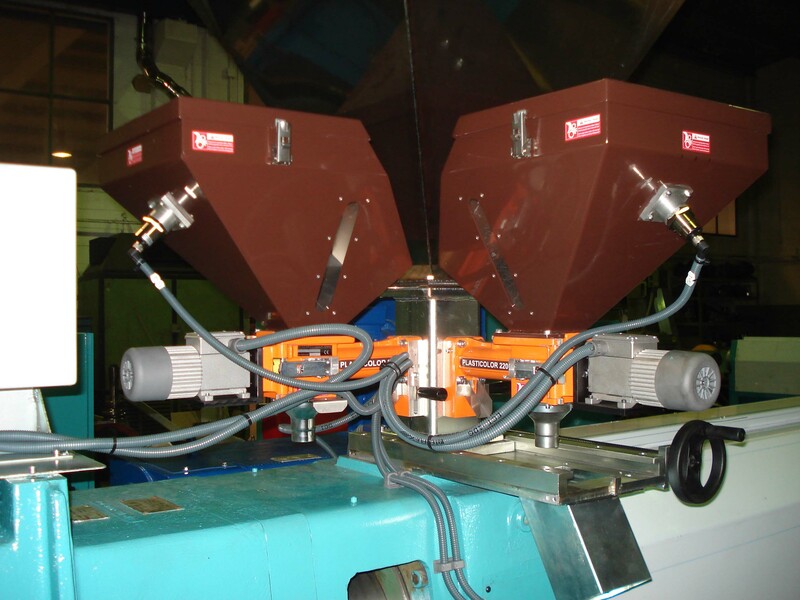 Pulling or giving caterpillars, with anti-return brake or motorized anti-return system. All elements are reversible in order to allow a 2-way working direction. 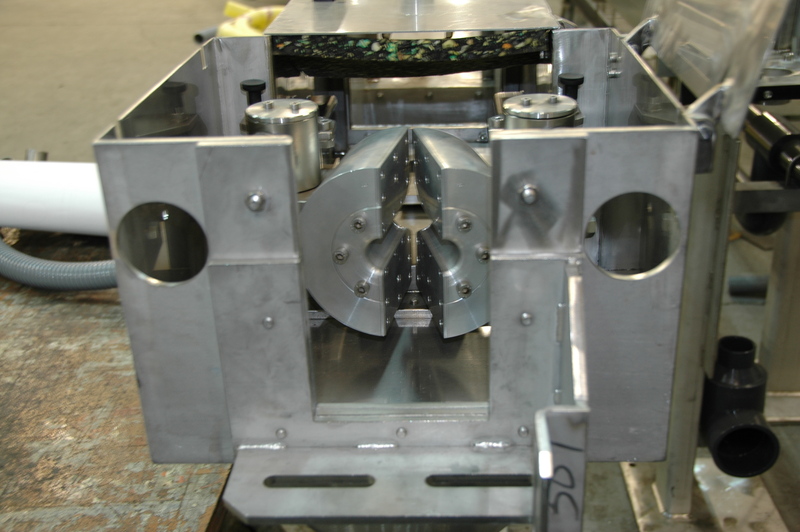 We manufacture for our extrusion lines all types of cooling troughs. 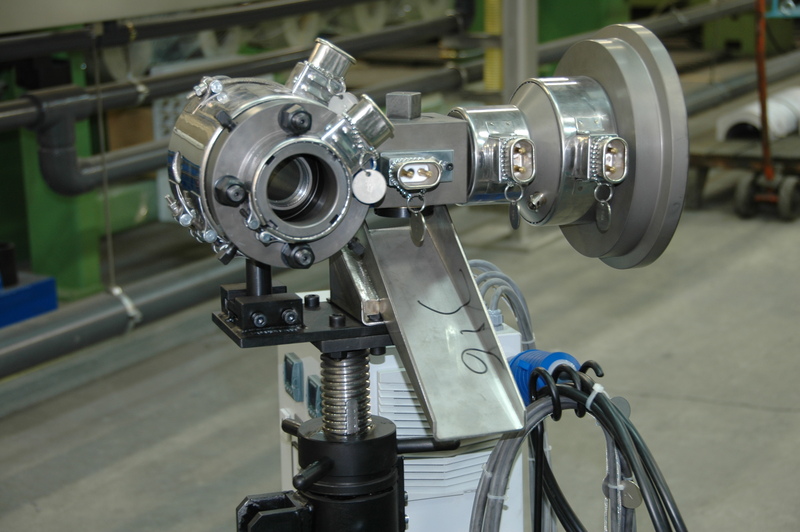 Generally the first section of the trough is telescopic in order to leave enough space for the maintenance of the cross head, and the last section of the trough has a drying device. The different models of troughs are the following : single pass section, multipass section, multipass section with motorized pulleys, cold water section, and hot water + cold water section. 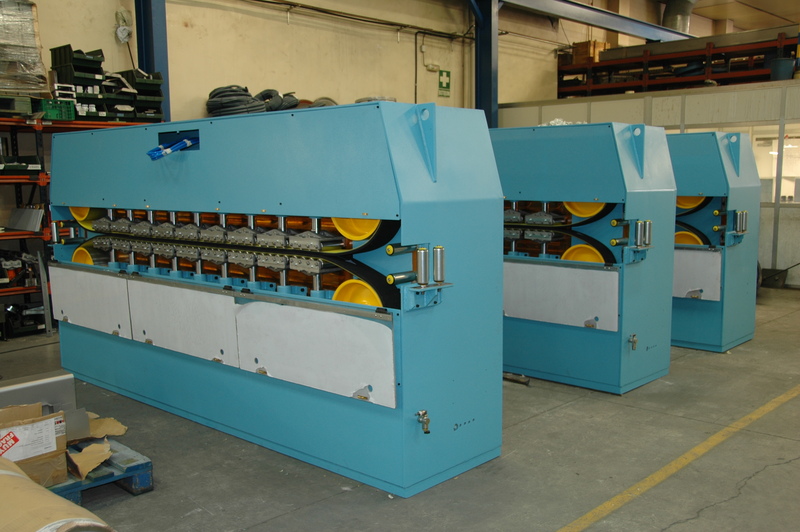 We manufacture horizontal and vertical accumulators depending on the needs of the customer and depending on the type of extrusion line where they will be installed. 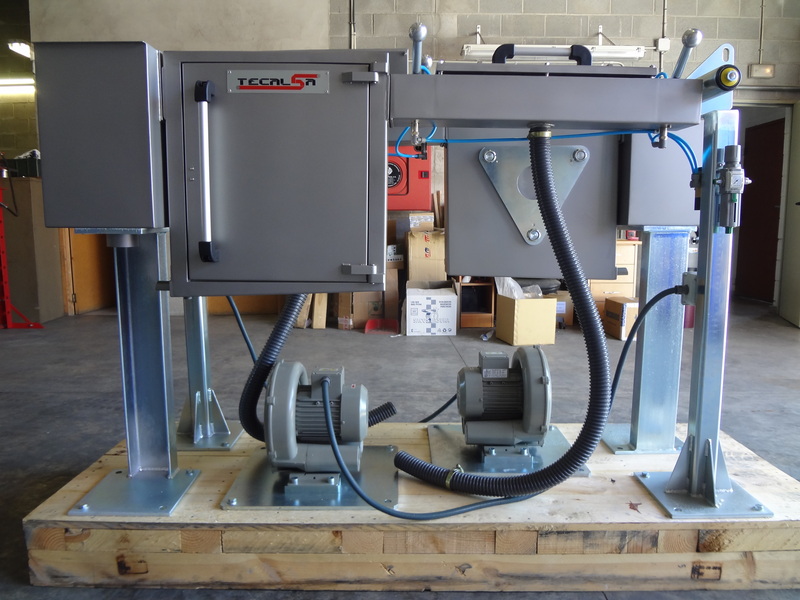 For instance for lines with automatic or semi-automatic double spooler, fast lines for low, medium and high voltage, or even dancers to be installed between the different motorized elements of the line (caterpillar, spooler, etc.). 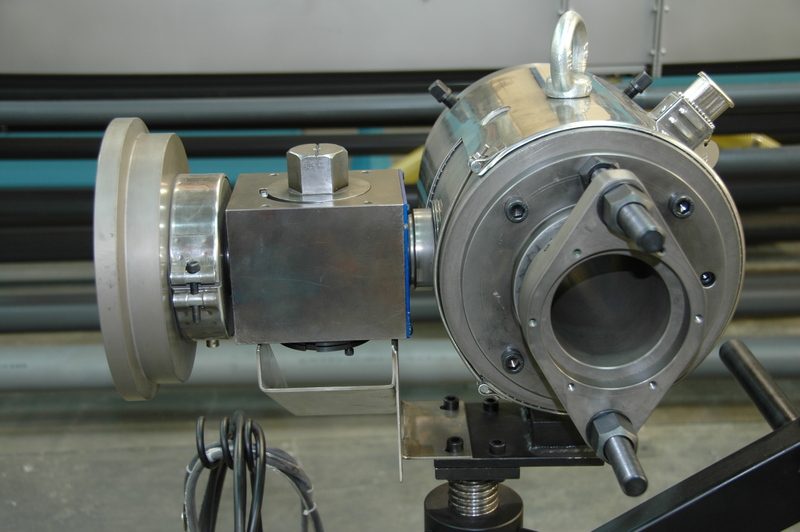 Diameter control devices (cold or hot), etc.